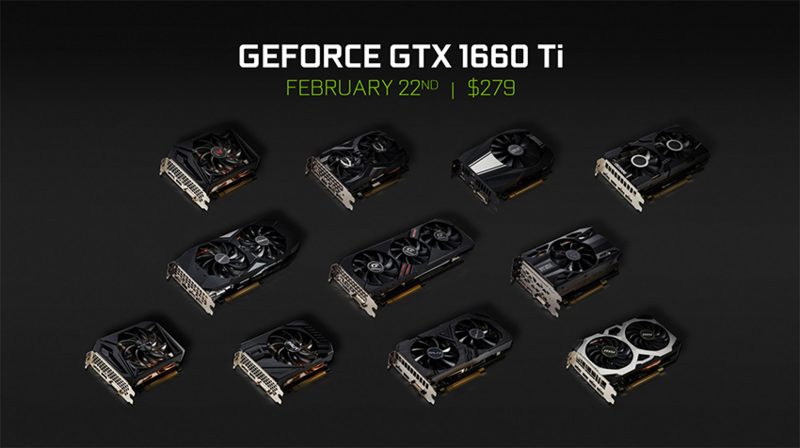 Nvidia has announced that its GeForce GTX 1660 Ti graphics card is now on sale. The new graphics solution can be purchased at prices starting at US$279.99. The latest addition to the GTX line-up offers 6 GB GDDR6 memory utilizing a 192-bit interface width and has 1536 CUDA cores. Its base clock is listed as 1500 MHz with a boost clock rate of 1770 MHz. The Nvidia GeForce GTX 1660 Ti graphics card has officially been released. Based on Turing architecture, the new GPU has been priced in a manner to tempt owners of older Nvidia products, such as the GTX 960 and GTX 1060, to upgrade to the GTX 1660 Ti. Newegg currently has versions of this graphics card from MSI, EVGA, Gigabyte, and Zotac priced at US$279.99. Nvidia has published a full specifications sheet for the GeForce GTX 1660 Ti graphics card (see below), although many of these were already known thanks to a recent leak. In terms of performance improvements, the green team has tested the GTX 1660 Ti against the GTX 1060 and GTX 960. Games were run on a system with an i9-7900X, 16 GB RAM, 1920x1080 resolution, Windows 10 x64, and high game settings. Some of the results were startling. For Doom (2016) the GTX 1660 Ti averaged 147.3 fps, compared to the GTX 1060’s 109.7 fps and the GTX 960’s dismal 39.4 fps. Neither of the older cards could manage over 40 fps for Shadow of the Tomb Raider, while the GTX 1660 Ti pumped out 53.9 fps. The GTX 960 was nowhere for Battlefield V (16.4 fps), but the GTX 1060 and GTX 1660 Ti offered playable rates, with 60.0 and 80.3 fps, respectively. Gamers with a GTX 960 or less should certainly take a closer look at Nvidia’s latest GPU.